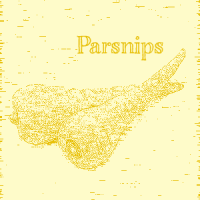 In Medieval Europe, where sugar was rare and honey expensive, Parsnips served as a common sweetener. This was before the introduction of the potato, making parsnips’ nourishment especially valued on frequent days of abstinence during the Lenten season. Like all root crops, the parsnip becomes sweeter with each morning frost, which causes the root’s starch to convert to sugar. A good source of potassium, fiber, Vitamin C and folate, parsnips make an excellent addition to soups and stews. Too fibrous to eat raw, peel parsnips with a vegetable peeler, the larger specimens may have a woody core that should be removed before cooking.